Experimenting with the possibilities of curatorial education and its potential to impact cultural development, CAFA Art Museum has invited six leading curatorial programs from the U.S.A., Europe, and China to join in the organization of the Biennale. No.8 Hua Jia Di Nan St. The CAFAM Biennale is organized by the Central Academy of Fine Art Museum, Beijing. Representing California College of the Arts, San Francisco; China Central Academy of Fine Art, Beijing; China Academy of Art, Hangzhou; de Appel arts centre, Amsterdam; École du Magasin, Grenoble, and the Royal College of Art, London, faculty members and alumni have collaborated on the overall conception and execution of this unique project as well as worked independently to present six distinct but related exhibitions that feature artworks from 68 artists and groups. The title of the Biennale—The Invisible Hand—refers to Adam Smith’s metaphor describing the self-regulating behavior of the marketplace. In the context of the six respective exhibitions the metaphor is extended to intimate something of the histories, methodologies, and theories that inform curating, without leaving visible traces of their impact. While they offer a variety of interpretations of the overarching theme, Smith’s presence is directly acknowledged in artistic gestures of political, social, sexual, and imaginative resistance to dominant modes of liberal politics and capitalist economics. At the same time, the museum is revealed as a theater of objects, which despite the mechanisms of display and interpretation yet enact their own tales. Its dense acreage of its storage areas is additionally understood as humanity’s cellar, the contents of which mirror our histories, while temporary displays in the galleries only reflect our prevailing ideologies. Curatorial and the artistic gestures of selecting, arranging, organizing, and displaying overlap and collide. Modes of classification favored by modern museology are usurped by artistic acts of selection and sorting which eschew order in favor of rupture. Through the exhibition and its associated conference and publication, the Biennale will thus highlight and promote the role of curating as a practice that constructs knowledge as part of an expanded ecology, which is integrated with academic education and social practice. Game Theory: Which Animals Are Most Like Each Other? 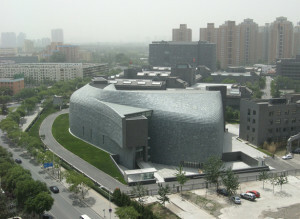 Photo: © CAFA Art Museum, Beijing.